Nick Waterhouse is a true California soul. A retro rhythm-and-blues-playing vinyl-collecting thick-framed-glasses-wearing guy oft seen in his neatly ironed menswear, wielding a hollow-body guitar and singing moody blues tunes is an artist you need to know. Rachel Ann Cauilan: I know you actually went to college here in the city. What can you tell me about those days? RAC: I know that you actually grew up in the Orange County area as well, so you pretty much are a full Californian. How would you describe the different music scenes [Bay Area versus Southern California] in that way? NW: It’s funny because I actually think the Orange County scene that I grew up in fed the San Francisco scene that came a couple years later. A lot of Southern Californians, we all moved here right around 2003, ’04, ’05 and there was a period of time up until about 2010 that I think a lot of those groups were aggressively active. It was like we fermented in Orange County, which was sort of repressed and not really culturally sophisticated. There was a really small group of people that were doing things with great passion but with no support from the [Orange County] community that we lived in. We came to the city because it seemed like a fertile place because of the history of it. And then [we] flourished. It was like we had all the weapons and then we showed up here. Now, I think there’s much more of an image of Orange County that I don’t personally know or participate in, but there’s a lot of bands that seem to want that aesthetic, which is interesting to me. RAC: When you talk about the image of Orange County, what do you mean? NW: It doesn’t seem real to me for people to say they want to be in Costa Mesa or sound like The Growlers. When I go to Europe and people ask me about Costa Mesa, which is basically a strip of a block where I made my records and grew up playing house shows, is now [a place] people in Denmark want to know what’s going on. Costa Mesa is kind of like a permutation of this garage, DIY thing that’s been broadcast around the world. It’s familiar to me but I don’t think it’s necessarily my world. It’s like the Summer of Love — it starts as something small, like the diggers and some anarchist collectives and some radical notions and a little bit of art and music, and then people like the broadcasted branded version of it and want to live that brand, which has little to do with what the original thing is. RAC: Your sound is also very rhythm-and-blues and vintage. Where did you get drawn into that kind of sound growing up? NW: I was around it my whole life. I got to go to school in England and it struck me that there’s a parallel there. If you’re an American and you grow up with American culture, especially 20 years ago when you would turn on the radio and hear songs written by some really great [people] — what would be considered the pinnacle of American folk pop music — and you had rhythm-and-blues and Latin and all this stuff happening in this period of quote-on-quote “oldies” and R&B, that’s when I started playing guitar. All my friends were learning alternative rock songs and it was like, wow it’s another power chord! Okay cool, another power chord. Cool, a chromatic thing. But then when you start playing R&B, it just feels natural. It feels like dancing. It felt really great to me and really familiar and expressive. RAC: I read somewhere that you didn’t like singing at first, which I find kind of funny because you sing in all of your songs! And you also have a background in producing for other artists. RAC: Can you tell me a little bit about why you didn’t like singing at first and what was your thought process behind all of that? NW: The thought process was, was if nobody does it then it’s not gonna get done, which is also the thought process that producing came out of. There’s nothing that I ever thought, when I was a kid, that I’m really good at this. It’s about being realistic about who you are and what your assets are, [like] you would look really silly if you tried to [do something] and you’re not fully committed to it and it’s not your thing. I know people who are amazing singers and I’ve been in rooms where that person could sing a phrase and just be like, “There’s a blue bag!” and everybody’s like, “Wow that guy can sing!” Nobody’s ever done that to me. So, it’s like the opposite of athleticism. It’s pure functionality and personality that my singing comes out of. RAC: So I know you came out with your third album last fall. Throughout the span of your three albums from the beginning, how would you describe your evolution into approaching your three albums? NW: The first record Time’s All Gone was a do-or-die, barely hanging on, I gotta get the job done kind of record. That’s not that it doesn’t have its charm but I think I was blindly diving into and committing to something. The second record Holly was having a bit of preproduction time and trying to solve the problem of what am I doing, why am I doing this [and] what is this career. The studio from my first record solved that problem for me because Mike [McHugh], who was the guy who owned [the first studio], demolished it and I just didn’t have anywhere to make my second record. So I had to find a new place, grow a little and change. The third record Never Twice seemed to be an extension of experiential knowledge of all the players I had met and the way that my songs work and the way that the groove is and what I had learned along the way producing and writing and singing. Each is a record of that period of time for me. RAC: Do you have a preference towards producing your own work or producing for other artists? NW: Producing for somebody else kind of takes the pressure off because I tend to be 100% harder on myself when I’m working on myself. I can be removed when I’m dealing with somebody else as long as somebody else has to sing the song. RAC: Do you have any long-term musical or career goals that you’ve wanted to dabble in that you haven’t had the chance to but would like to in the near future? NW: Yeah! I’m really interested in scoring but not in traditional scoring. Like film and doing music for movies, but it’d have to be a partnership with a director that we both are sympathetic. I really love the score from Chinatown and I love Johnny Greenwood’s [Radiohead] work from PT [Paul Thomas] Anderson. And I just want to keep making records. My ultimate goal is to get an in-house thing where I control the means of production and manufacture. It seems my entire career feels like an endless hallway that you have in a dream where you keep thinking you’re getting closer to the door at the end of the hall and it doesn’t happen. RAC: Do you have any current projects that you’re currently working on this year? NW: Yeah. I’m producing John Patisse’s debut record, which is almost done. We’re in the mixing process. And I’m writing new stuff to start cutting the end of this year as a 45 [rpm single] or EP probably. RAC: Is there anything you can tell us about what we can expect from that? NW: It’s just moody and blue, like all the other tunes that I write. RAC: What drew you to playing music in the first place? NW: It was a lot more rewarding than sports and I really liked books but you couldn’t really meet anybody that way, haha. It just felt really natural and if I’m real about it, the one consistent thing through my entire life that I never asked a question, is that I never never never don’t buy a record, or don’t buy music, or don’t read about music. That’s always a constant thing. If I’m real about what I care about, [music] is what takes up most of my brain. RAC: Do you have any advice for younger artists? NW: Keep trying and respect thyself. Find the thing that’s true to you and be really honest to it. Don’t rely on other people to tell you what it is or what to do with it. I think more and more we’ve moved into a period of needing to be self-sufficient, almost to a fault, where all these guys just latch on at the end of you going through your process. Nobody develops artists anymore. NW: That’s basically what happened with me. It’s what I was saying — I’ve never been the singer that makes anybody in a room say, boy that guy can sing, but I had a bigger idea than just being a great singer. If you’re young and you’re interested in it, be honest. And to the people that don’t actually care about music, stay out of music, because there’s a lot of those. They just want the lifestyle and don’t actually care about music, you know. RAC: Are there any last words you’d like to say about San Francisco? NW: I sure do miss it. Just look for me walking by the Presidio or something. Complete with a six-piece act of backing vocals, drums, an accompanying bassist, pianist and saxophonist, Waterhouse has created a sound of his own — something lying between rock ‘n’ roll, rhythm-and-blues, jazz and neo-soul. 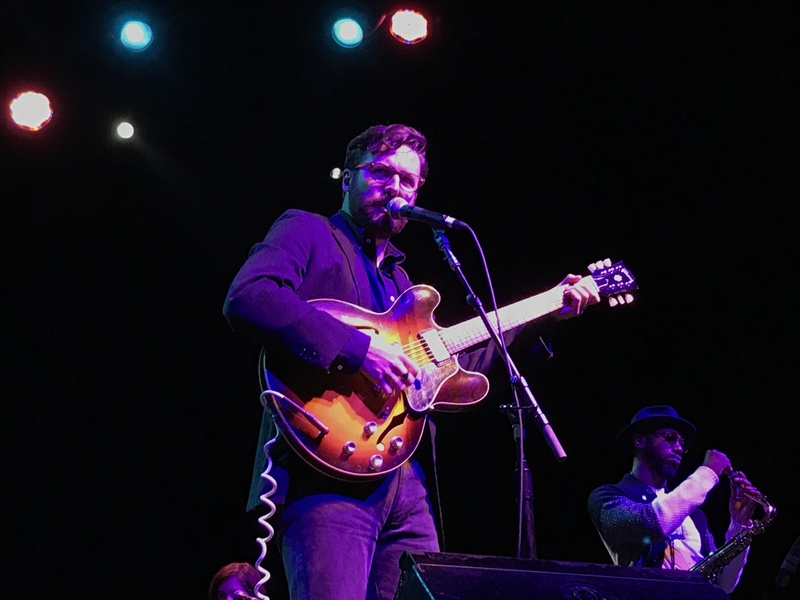 The so-called “young man who makes old music” played songs generously from all three albums — classics like “This Is A Game” and “I Can Only Give You Everything.” The catchy “Katchi” (Louisiana slang for “loving touch”) with good friend and fellow old soul Leon Bridges excited the crowd as the infectious “L.A. Turnaround” brought in plenty of sing-alongs. His love for San Francisco was made apparent through “Stanyan Street,” inspired by the real Stanyan Street. As someone who was never interested in being a “star” or the greatest singer and only wants to make great music with great people, Waterhouse’s performance showed just that. His retro-style soul brought us back into the sounds of the ’50s and ’60s, without seeming like he’s trying too hard. His sounds fits and is astoundingly authentic. He let his band sing through musical interludes. His mastery of instrumentation was made present through several duos with touring keyboardist J.B. Flatt. The Tarots’ smooth dance moves and tambourine section were reminiscent of old-timey records. Nick Waterhouse's latest album Never Twice  (2016) is available for purchase now. Be sure to also check out his albums Holly  (2014) and Time's All Gone  (2012). Keep up with Waterhouse at nickwaterhouse.com.